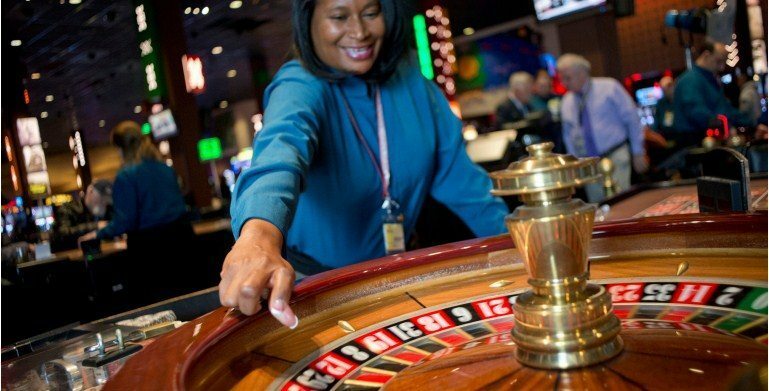 Roulette is an easy game to play and our dealers are always happy to answer your questions. The roulette wheel is marked with the numbers 1-36 as well as “0” and “00”. The numbers are alternately colored red and black with the zeroes marked green. Wagers can be made in various number and color combinations. Players may bet on individual numbers or a group of multiple numbers. Once the bets are placed, the dealer will spin the ball, mark the number and pay winning wagers. Payouts vary based on how many numbers a bet covers. Straight-up bets on one number pay 35 to 1. A split on two numbers pays 17 to 1 and a corner bet on four numbers pays 8 to 1.